Paul Rendon was born in San Diego, California in 1973. He studied Music Composition at The University of Toronto (Ontario, Canada) and Music Education at San Diego State University. While at San Diego State University he was granted a fellowship with the California Music Project. For his academic achievement and contributions to the SDSU School of Music and Dance, he was admitted membership into The San Diego State University ETA THETA Chapter of Pi Kappa Lambda, a national honor society in music. He received his teaching credential from San Diego State University. 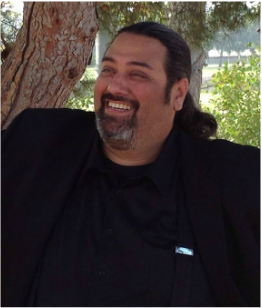 Since 2011 he has been the assistant band director at Rancho Buena Vista High School in Vista, California. Currently he has written the 2013 and 2014 field shows for Steele Regiment. David Maslanka was born in New Bedford, Massachusetts in 1943. He attended the Oberlin College Conservatory where he studied composition with Joseph Wood. He spent a year at the Mozarteum in Salzburg, Austria, and did masters and doctoral study in composition at Michigan State University where his principal teacher was H. Owen Reed. David Maslanka worked with Steele Canyon in Spring of 2013 on his piece Mother Earth. Samuel R. Hazo (b. 1966) resides in Pittsburgh, Pennsylvania with his wife and children. In 2003, Mr. Hazo became the first composer in history to be awarded the winner of both composition contests sponsored by the National Band Association. He has composed for the professional, university and public school levels in addition to writing original scores for television, radio and the stage. His original symphonic compositions include performances with actors Brooke Shields, James Earl Jones, David Conrad and Richard Kiley. He has also written symphonic arrangements for three-time Grammy Award winning singer/songwriter Lucinda Williams. Mr. Hazo’s compositions have been performed and recorded world-wide, including performances by the Tokyo Kosei Wind Orchestra (national tour), the Birmingham Symphonic Winds (UK) and the Klavier Wind Project’s recordings with Eugene Migliaro Corporon. Additionally, his music is included in the series "Teaching Music Through Performance in Band." Mr. Hazo's works have been premiered and performed at the Music Educators’ National Conference, Midwest Band and Orchestra Clinic, World Association for Symphonic Bands and Ensembles Convention, National Honor Band of America, National Band Association/TBA Convention, College Band Directors’ National Association Convention and also aired in full-length programs on National Public Radio. He has served as composer-in-residence at Craig Kirchhoff’s University of Minnesota Conducting Symposium and has also lectured on music and music education at universities and high schools internationally. In 2004, Mr. Hazo's compositions were listed in a published national survey of the "Top Twenty Compositions of All Time" for wind band. Mr. Hazo has been a music teacher at every educational grade level from kindergarten through college, including tenure as a high school and university director. Mr. Hazo was twice named “Teacher of Distinction” by the southwestern Pennsylvania Teachers’ Excellence Foundation. He received his bachelor’s and master’s degrees from Duquesne University where he served on the Board of Governors and was awarded as Duquesne’s Outstanding Graduate in Music Education. Mr. Hazo serves as a guest conductor and is a clinician for Hal Leonard Corporation. He is also sponsored by Sibelius Music Software. Recordings of his compositions appear on Klavier Records and Mark Records. Mr. Hazo worked with Steele Canyon the Spring of 2012 on his pieces Voices of the Sky and Today is the Gift.